World Original Nordic Walking Federation (ONWF) acknowledge these persons in these distances Nordic Walking World Champions 2018. We stay wait year 2019 games! Itselläni on ollut murtsikkahiihtoon kaksijakoinen suhtautuminen. Toisaalta olen nauttinut hiihtämisestä ihan älyttömästi. Ja toisaalta sitten – varsinkin lapsena koulussa – elämäni vaikeimmat hetket olivat ne älyttömät hiihtokilpailut. Hiihtäähän minä osasin, ja motivaatiota kyllä löytyi, mutta kun otiin sen verran köyhiä ettei ollut kunnon välineitä. Sukset oli mitä sattui ja monot olivat jonkun sukulaisen vanhat ja liian isot. Muistan jokaisessa kilpailussa oksentaneeni ainakin kerran… 😦 Sisu ei antanut periksi, vaikka sitten joutui juoksemaan sukset jalassa koko lenkin kun lumi tarttui kiinni suksenpohjiin. Monelle hiihto on suoranaista terapiaa. Teknisesti oikeaoppisessa hiihtotavassa vauhtia potkaistaessa käytetään koko vartaloa. Pieniä jalan lipsumisia lukuun ottamatta hiihtoa voi pitää selälle hyvänä treenimuotona. Edes ikä ei ole hiihdon esteenä. 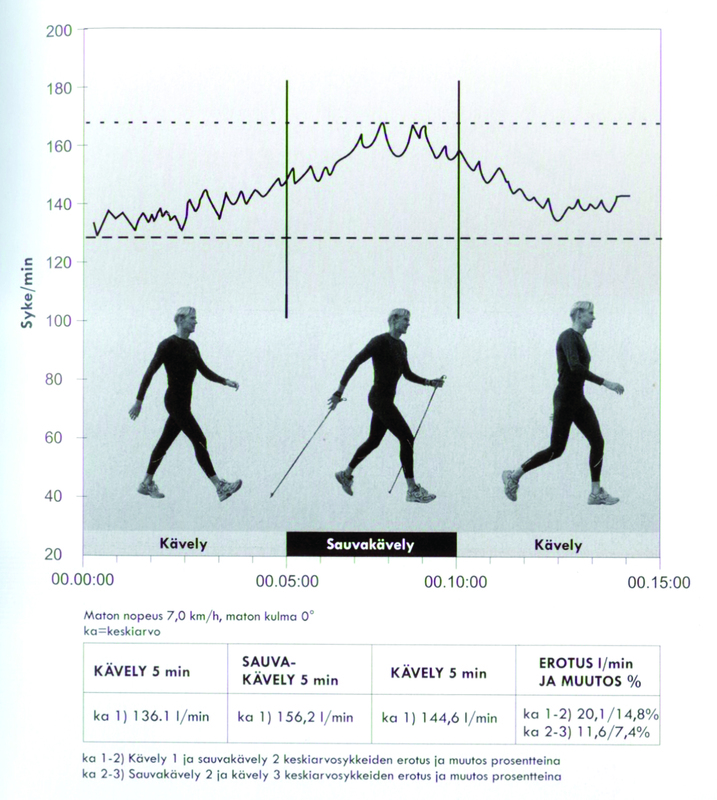 The test shown on below was carried out at the Finnish Sports Institute in Vierumäki (www.vierumaki.fi) with the medical station’s treadmill on 20 January 1999. The Table below was previously published in the guidebook From Sauvakävelystä Sauvaliikuntaan eng. 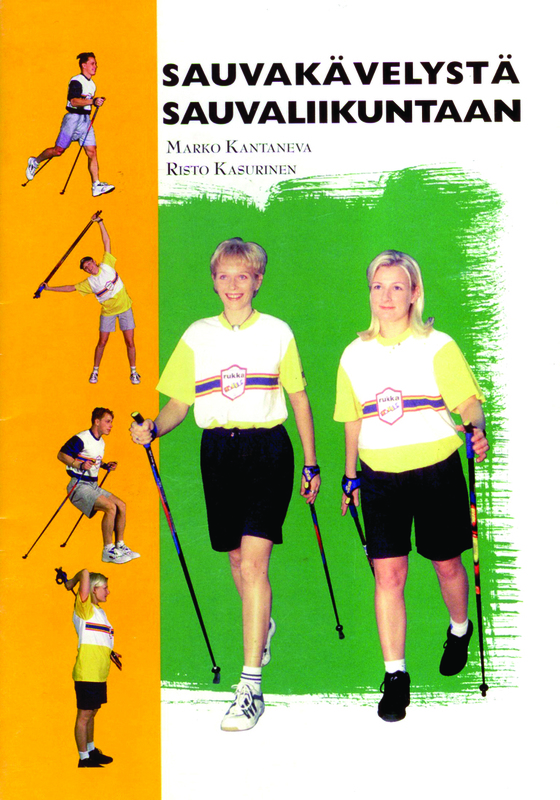 Nordic Walking to Pole Sports (M.Kantaneva, R.Kasurinen 1999). The purpose of the test was not to provide scientifically incontestable proof of increased heart rate resulting from Nordic Walking as opposed to normal walking. It was rather a concrete repeated test involving one individual, during which the heart rate curve variations at constant speed and constant slant of the treadmill was monitored. During the test, heart rate variations were monitored when a 5-minute walk was followed by 5 minutes of Nordic Walking. Furthermore, the purpose of the test was to find out what happens to the heart rate, if another 5-minute normal walking trip was taken after a Nordic Walking trip. There was no pause between the mode changes, instead the test continued without stopping for 15 minutes. 3. So, what is Nordic walking? 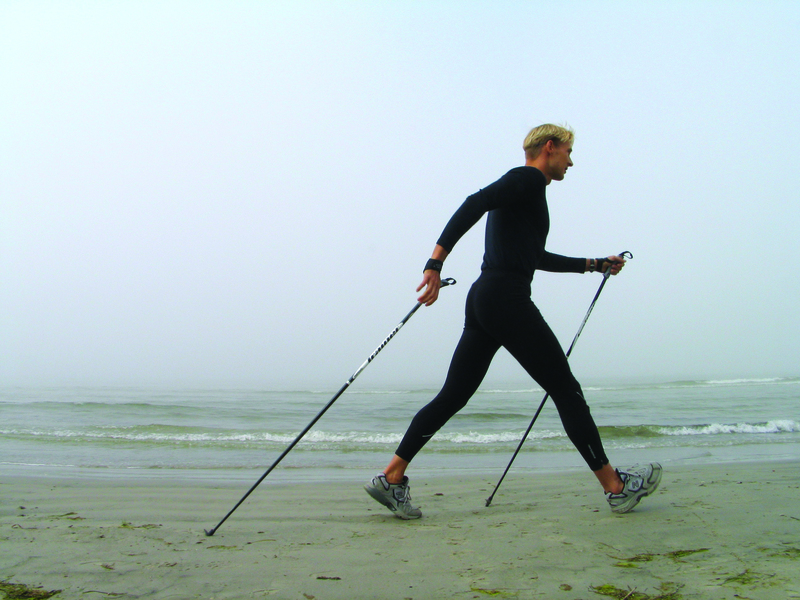 In brief, Nordic walking is enhanced walking where the arms are also used to push. In Nordic walking, the movements of your arms, feet, pelvic area and the entire body are similar to those employed during a vigorous walk. 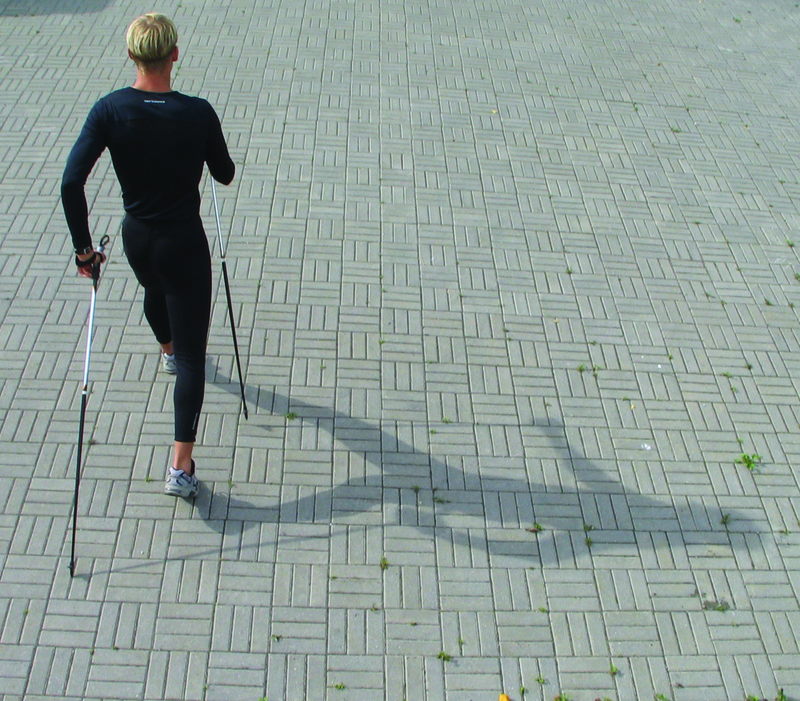 In Nordic walking, the opposite arms and feet swing in alternation and rhythmically forwards and backwards just as in normal walking, but clearly more intensively. It is important to try to learn the correct rhythm and swing moves of Nordic walking as correctly as possible right from the start in order to ensure the best training effects. The amplitude of arm swing in the back and forth direction also sets the swing breadth of the lower limbs, i.e. the legs. Short arm motions are translated into short pelvis and leg motions. The same happens vice versa, when one walks with short strides. In this case, it is impossible to make extensive back and front arm swings. The further the pole is thrust back behind the pelvic line, the longer the stride required. The longer and more complete the above-mentioned swinging motion of the upper and lower limbs, the stronger the twists of the pelvis, chest, neck and shoulders. Nordic walking performed with wide and maximally large as well as alternating overall joint angles is an extremely good workout as well as beneficial for the skeleton and organs. 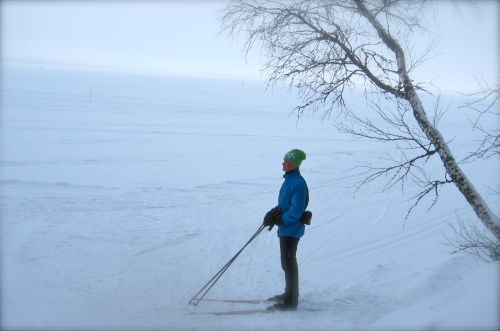 So, what does Nordic walking offer you? In addition to improvements in personal physical wellness, Nordic walking offers enthusiasts much more. A lively mind means that you are happier. Poles have given you motivation for regular physical activity. Flexibility provided by pole gymnastics. All this gives you the feeling of more zip vigour and vitality etc. 2. Why is Nordic walking the best all-in-1 workout in the world? • Using Nordic walking devices – the poles – you can perform a number of movements that will make you more agile, stronger and fitter. Before taking up Nordic Walking its good to first focus on walking and its performance. Walking is a skill given to us all at birth. Walking is also the foundation of Nordic Walking. Walking is a safe form of endurance-building exercise which everyone may enjoy. When walking the muscles of the legs, hips, mid-torso and arms all work together. For example, a seventy-five kilogram man actively employs some 12-15 kg of muscles when walking. Walking means exercising at sub maximum effort. It is also safe for the support and movement systems because the centre of gravity of the body is kept close to its centre. This reduces strain on the feet, ankles, knees and lower back. The load borne by the lower limbs during the striding action is roughly equivalent to the weight of the body. By contrast during jogging the corresponding load is some three times greater than the body’s own weight. On the basis of controlled training studies regular walking for fitness in adults not only improves endurance but also blood lipid profiles and the body’s general composition. Walking also has favourable effects on the resting blood pressure, bone strength and mental attitude. In both jogging/walking studies of Swiss men and studies of walking exercising in Finnish adults results indicated that vigorous walking raises aerobic endurance and improves health. The amount of energy consumed during walking depends on the speed of walking and on body weight. Already at normal walking pace the body’s metabolism increases threefold in comparison with the resting condition. If the speed is over 7 km / hour then the energy consumption is comparable with that during jogging. An eighty kilogram adult uses 60% more energy during vigorous walking than does a person weighing 50 kilograms. A medium-sized woman thus uses considerably less energy during walking than a normal-sized man with the same speed. If the walking surface is soft and especially if it is hilly the energy consumed goes up. Vigorous arm action and, e.g. use of poles, hand-held weights or elbow weights all increase energy consumption as well. Use of extra weights may however reduce the walking speed so that its overall increase in energy consumption is also reduced. Table 1 shows the energy consumption occurring during vigorous walking (6 km/hour) in people of different weights. Walking with a good technique means that the stride begins as the heel touches the ground and ends when the toe together with the ball of the foot pushes itself off the ground. The pelvis lifts up high and the general posture is taut and forward leaning. The upper and lower torso are involved in a clearly defined counter-swinging motion during which the mid-torso muscle groups are actively worked. Opposite arms and legs swing alternately forwards and back. Through the years researchers have used differing terms to describe the various phases of walking. In Finland the terminology is now established as follows: heel strike, mid-foot support, heel raise, toe thrust, initial swing, mid-swing and closing swing.